Trinity Candle Factory Premium Scented Jasmine Candle - Votive Candle - 24 Pack. This Votive Candle 24 pack comes in all fragrances, premium scented for maximum fragrance throw. With a 15-20 hour burn time, cotton wick and premium scent. This Jasmine fragrance is an old fashioned favorite. The scent of the morning jasmine flowers lingering in the morning breeze. A very nice floral aroma. 100% Satisfaction Guarantee. Jasmine - Reed Diffuser Oil - Refill - 8 oz. 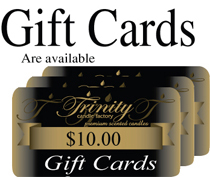 I really like Trinity Candles. These votives are scented all the way through and you waste no wax. I continuing buying these candles for personal use and as gifts.